This was part of a large memorial outside Newton’s Edmond Town Hall. The picture was taken Dec. 20, the same day four of the slain schoolchildren killed and two of their teachers had funerals. A neighbor made this sign across from Honan Funeral Home on Newtown’s Main Street. The funeral home held wakes for many of the 20 children killed in the Dec. 14 massacre. This sign in front of a house on Main Street in Newtown, is one of many memorials in honor of the 26 victims of the Sandy Hook Elementary School shooting last Friday. Memorial for victims from last Friday's shooting massacre at Sandy Hook Elementary School in Newtown, Conn. on Thursday December 20, 2012. The Newtown General Store, near the funeral home that has had wakes for many of the 20 children killed, has been offering free grief counseling for anyone in the town of roughly 27,000 people. Student Paula Castaneda signs a memorial poster, during a candlelight vigil held to remember the Newtown massacre victims at Norwalk Community College in Norwalk, Conn. on Tuesday December 18, 2012. A sign of support for teachers near the Sandy Hook Elementary School, Saturday, Dec. 15, 2012. Town resident Adam Lanza, 20, is suspected of killing 27 people at the school Friday morning. 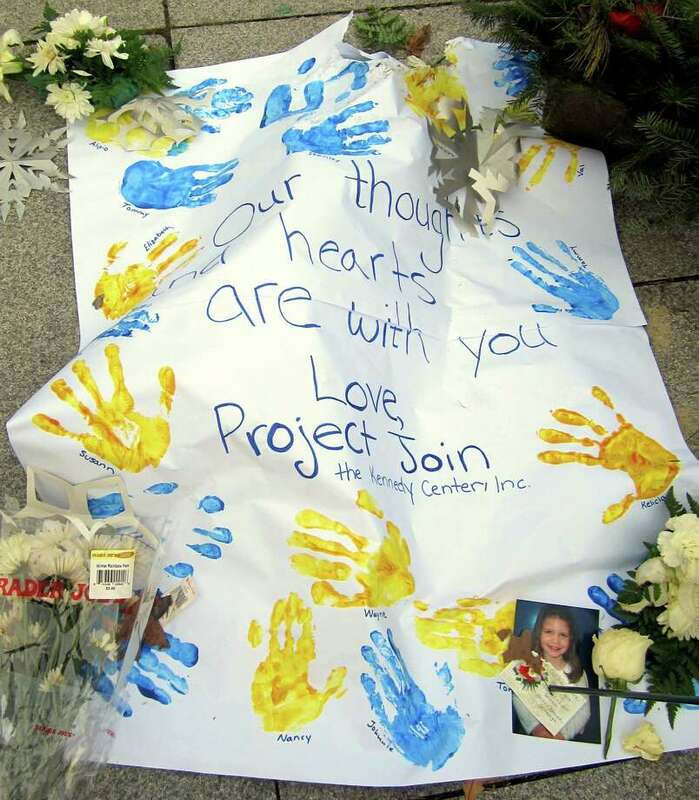 This sign is pictured Dec. 20, 2012, the day that four children and two adults killed had funerals in Newtown. A sign in the Sandy Hook neighborhood of Newtown, Conn., Dec. 15th, 2012, the day after the mass shooting at Sandy Hook Elementary school on Friday. "God Bless Sandy Hook Elementary" reads a sign near the Sandy Hook Elementary School sign which is on the corner of Riverside Road and Dickinson Drive in Sandy Hook, Conn., Saturday, Dec. 15, 2012. A memorial for victims from last Friday's shooting massacre at Sandy Hook Elementary School in Newtown, Conn.